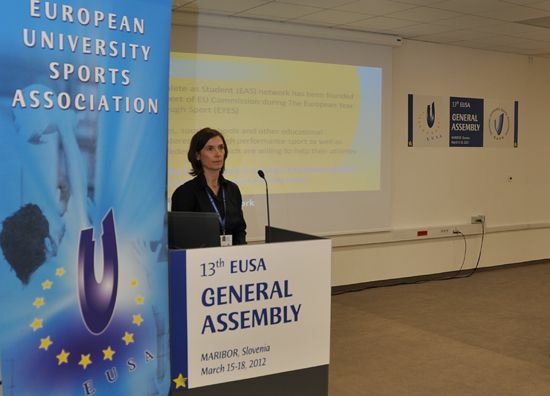 On Friday, March 16, European University Sports Association organised the EUSA Conference entitled Embracing University Sport. 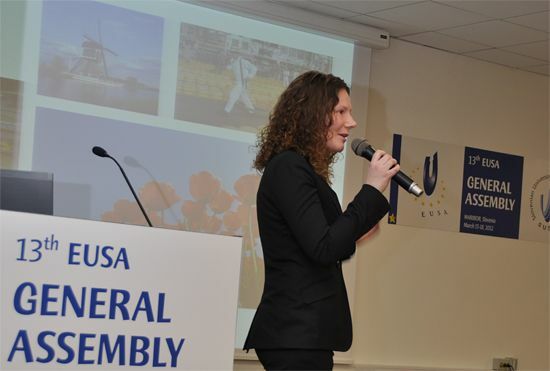 The event took place in Maribor, Slovenia and was a prelude to the EUSA General Assembly, to take place the next day. The theme of the conference were the dirfferent aspects of university sport, with the focus on Europe, and the necessity to also focus on matters beyond sport itself, thus embracing the whole spectrum of the student sport sphere. 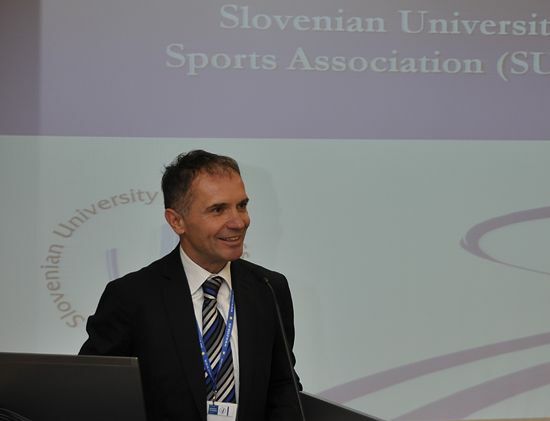 The conference was opened by the President of European University Sports Association Mr Alberto Gualtieri who also chaired the event, followed by a welcome address of prof. dr. Otmar Kugovnik, the President of the Slovenian University Sports Association. The first panel was the European Policies on Sport, with prof. dr. Mojca Doupona Topič, representing the European Athlete as Student Network – EAS and msc. 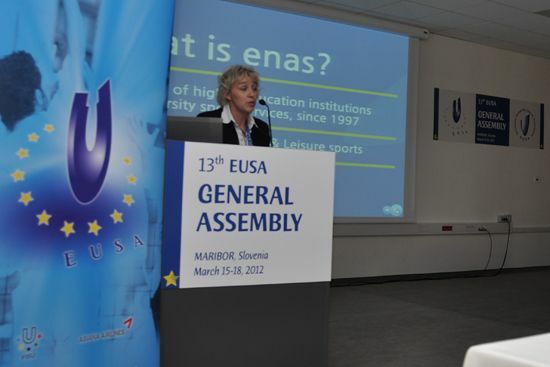 Pika Radmilovič, representing the European Network of Academic Sports Services – ENAS as the speakers. The second panel was devoted to the European Universities Games, a new multi-sport student event, governed by EUSA. 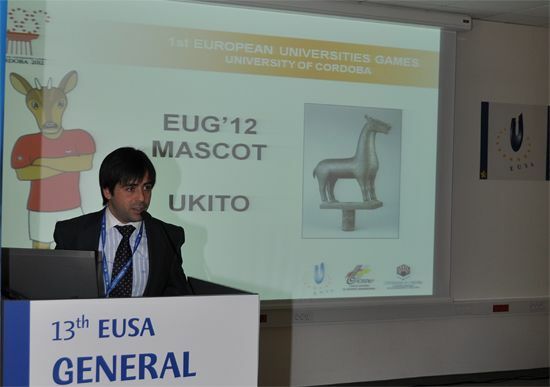 Mr Matjaž Pečovnik, EUSA Secretary General gave the introduction to the Games, and the Organising Committee of the 1st European Universities Games, to take place in Cordoba, Spain this summer followed. Mr Juan Manuel Hueli Amador, the new Secretary General of the Spanish University Sport Committee – CEDU first addressed the audience, followed by the presentation of the Games by Mr Rifaat Chabouk, General Coordinator of the 2012 Games. After the presentation of the upcoming 1st edition of the EUSA Games, the Organising Committee of the 2nd European Universities Games, attributed to Rotterdam, the Netherlands for 2014 presented their project. Mr Menso de Maar and Ms Hester de Vries presented the concept of the Dutch edition of the Games, emphasising the cultural diversity and sports experiences of the host city. 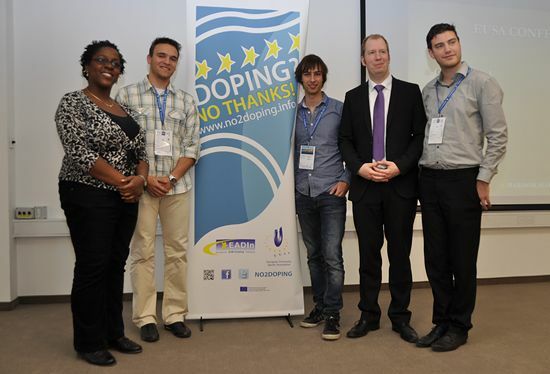 The next panel was devoted to the European Anti-Doping Initiative (EADIn). Mr Jan Holze, ENGSO Youth President opened the session, giving some background information about the project, its roots and future continuations. 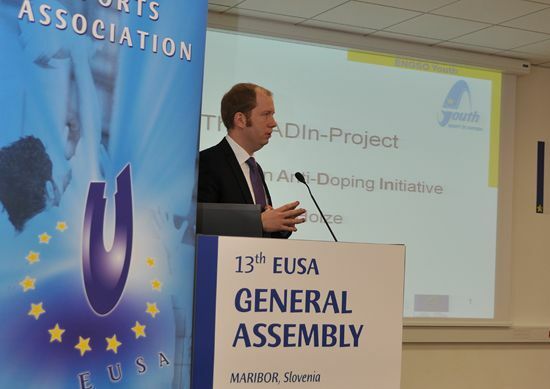 The project is partially funded by the EU programme Preparatory Action in the field of sport, and promotes healthy sports participation, without drugs. After the presentation of Mr Holze, the floor was give to Mrs Abosede Ajayi, EUSA Medical Commission member and EADIn coordinator who gave an overall review of the activities taking place in the project within the scope of EUSA. Mrs Ajayi then gave the opportunity also to the EUSA Junior Ambassadors to address the audience and give report of their activity within their home countries. Mr Andre Bonello explained the activities undertaken in Malta, Mr Jan Družina reported on the activities in Slovenia, Mr Luka Rukavina and Mr Marko Žunić gave the report of Croatian actions. After the lunch break prof. dr. Otmar Kugovnik presented the overview of the 15 years of the Slovenian University Sports Association and as the President of the organisation mentioned the successes but also the challenges that SUSA is facing. He also took the opportunity and present two awards for the support exhibited towards SUSA – Mr Alberto Gualtieri as the President of EUSA and Mr Oleg Matytsin as the President of the Russian Students Sport Union. In the panel Sport and Cultural Events representatives of the member federations presented their projects and initiatives. Mr Arie Rosenzweig and Michalis Kyritsis presented the concept of We are the World, project aimed to bridge the gap between different nationalities, races, religions via leisure sport and cultural activities. Mrs Lotte Uutinen and Mrs Hilkka Laitinen presented the SELL Games, a traditional student event which also has the EUSA Patronage. This part was concluded by the presentation of Mrs Ivana Ertlova, who presented the project of the University Marathon in the Czech Republic. The final panel of the conference was the topic of Women in Sport. 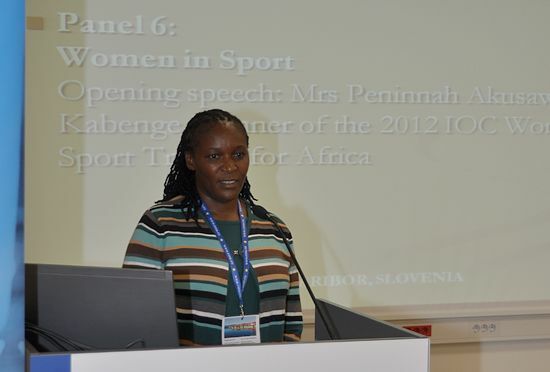 The Opening Speech was given by Mrs Peninnah Akusawesa Kabenge, Winner of the 2012 IOC Women and Sport Trophy for Africa. In her speech, Mrs Kabenge stressed the importance of active inclusion of women in sport, not just on symbolic, but also on practical level. She saluted the commitment of EUSA to promote gender equality in University Sport in Europe and expressed her willingness to cooperate with EUSA also on international level. Mr Aitor Canibe Sanchez and Mrs Johanna St. Clair Renard presented the latest numbers of the participation in EUSA events according to gender, and gave an overview of the activities which have been undertaken by EUSA in the field of Gender Equality and active involvement of women in sport. The conference concluded with the official signing of the Brighton Declaration on Women and Sport. On behalf of the European University Sports Association, the Declaration was signed by the President of EUSA Mr Alberto Gualtieri, in the witnesses of Mrs Johanna St Clair Renard and Mrs Peninnah Akusawesa Kabenge.